My second trip to the Hawaiian islands happened in April of 2004 during the final days of my wife's stay in the region. Having already "explored" the Big Island, this time we chose to visit the other end of the spectrum, Kaua'i. 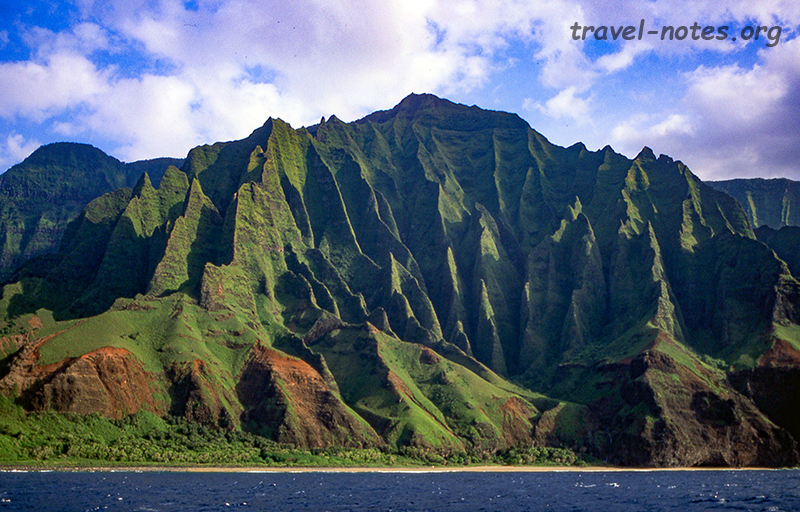 Kaua'i is the oldest, greenest, wettest and the westernmost of all the islands i.e. if you don't count Ni'ihau and other isolated ones where one is not permitted to travel due to political and ecological reasons. 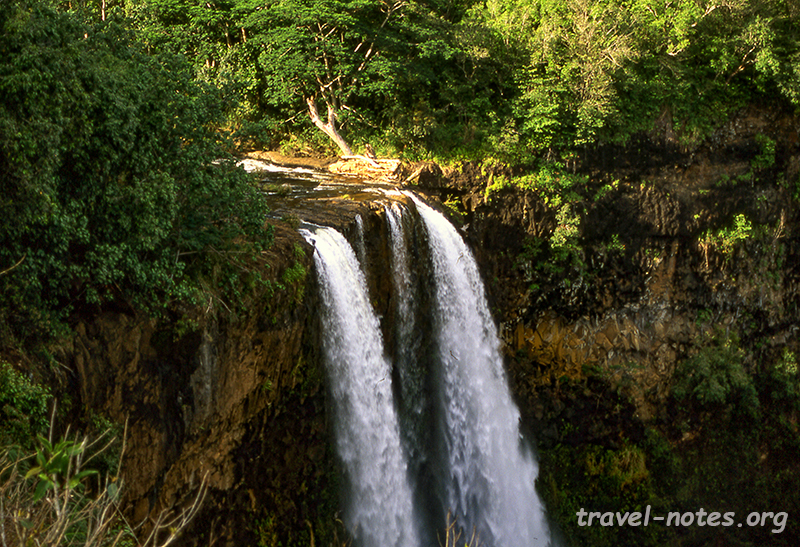 Kaua'i also hosts the Mount Waialeale, the wettest spot on the earth - yes, wetter than Amazon, Milford Sound and Chirrapunji. Having the experience of Fiordland (New Zealand) behind us, we were glad that we were better prepared (at least mentally) when the occasional showers threatened to ruin our party. Our main agenda on the trip was to walk the famous Kalalau Trail in the most spectacular part of the island, the northwestern Na Pali coast. Na Pali (which stands for "The Cliffs" in the local tongue) gets its name from dramatic coastal cliffs which abruptly rises from the ocean edge to a height of about 4000 ft. 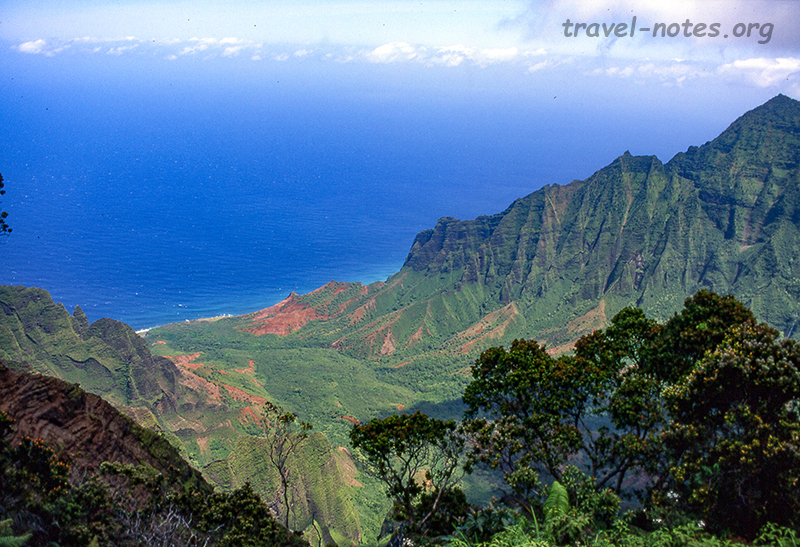 The only way to reach this part of the world is either by kayaks or by walking the Kalalau trail. The trail, considered by some as the most dramatic in the US, is 11 miles (each way) and hugs the coast for most of its length. What makes the trail challenging are the facts that the only place to camp are at its end points, in parts it narrows down to about a foot wide with a 500 feet drop to the Pacific and involes three stream crossings. After sliding along the first muddy 4 miles of the trail, we came to the first of the three streams which, thanks to the recent rains, had grown to a river. Never having waded through water outside of a clogged bath tub, we just waited at the banks for the first biped to come by and show us the way to cross it. It happened to be one of the current residents of the region who appeared out of nowhere on the other side of the bank and after a three quick jumps was standing beside us. With a huge machete and heavily bearded look, he resembled a sadhu in Rishikesh more than a pacific islander. In between his treatise on Upanishads we managed to learn that he was from Seattle and has been living here for two years subsisting mainly on avocados and coconuts. More importantly, we learnt that the stream in front of us was shallowest of the three and all of them were bound to swell the following day due to the imminent rain fall. It was enough for us to beat a retreat and we promptly did that after donating some of our food weight to the stranger. We spent the rest of the day driving to the lesser known attractions of the island of which only the Wailua Falls and the Kilauea Wild Life Refuge were worth the effort. 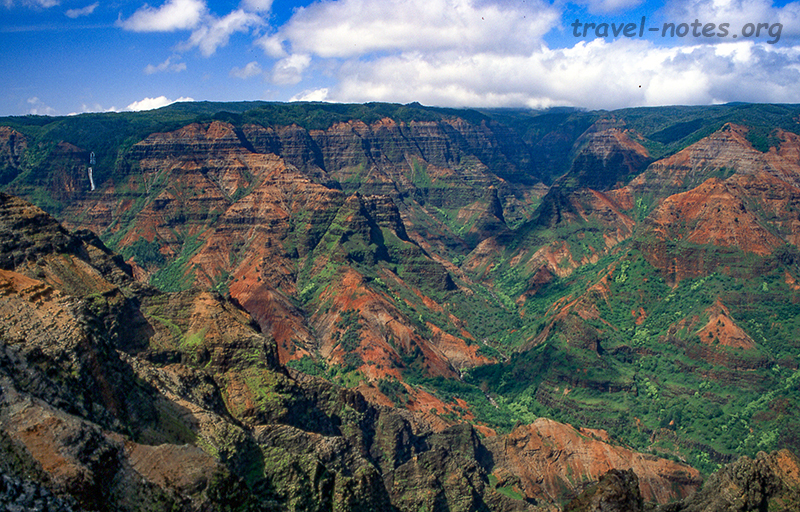 On the following morning we drove to the twin (state) parks of Waimea Canyon and Kokee. The former, named as the Grand Canyon of the Pacific by Mark Twain, is a pretty canyon although it pales in comparison to its role model in everything except perhaps in greenery. The latter is where most of the cliffs of Na Pali stop rising and hence houses much hiker friendly trails - all of them leading down to the individual valleys of the rugged Na Pali coast. We had just enough time to walk one of the Kokee trails, Awa'awapuhi, before heading down to the coast to a catch a Na Pali cruise. Having failed the rugged way to see the place, we were forced resort to the popular way to see Na Pali - via a boat. We were treated to one of the most spectacular scenery that I have seen on the planet. None of the travel books/writings that I read could come anywhere close to describing the actual thing. Hence, I wouldn't even bother to attempt to describe the place in words. All I can say is that the place pushed the humpback whales and a spectacular sunset - the other also-seens during the trip - to the footnotes. We headed back to Kokee park for the last day of the trip to complete the unfinished effort of the previous morning. We walked down the Nualolo trail to another valley lookout before finishing off at the best view point in the region, the Kalalau lookout, which looks down on the valley where our Na Pali trek should have ended. 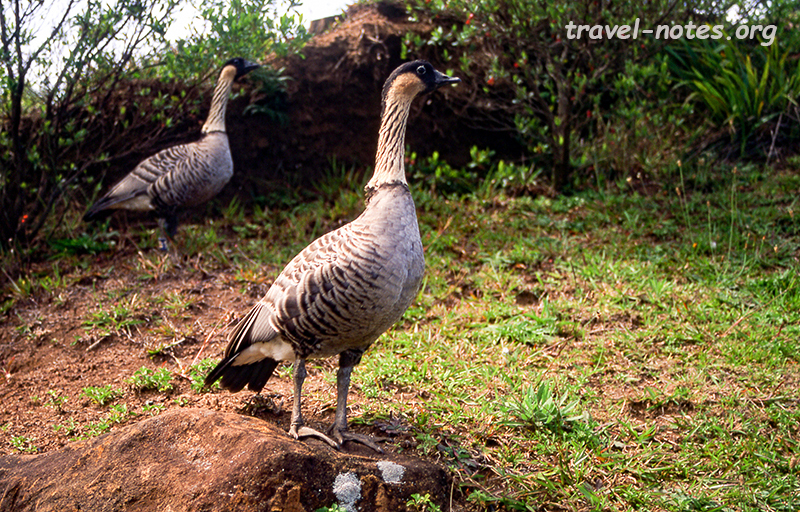 Click here for more photos from the island of Kaua'i, Hawai'i.